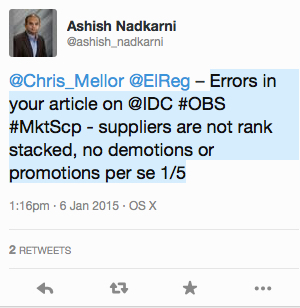 – mkt share is relative, doesn’t show the sum of all #OBS capable products, only those evaluated. We were puzzled by this, particularly about EMC's treatment. Its ECS (Elastic Cloud Storage) was introduced in May 2014, after the 2013 Marketscape came out but Atmos and other EMC object storage systems are still being sold. ECS does not replace Atmos, as far as we know. The 2014 IDC report abstract says: "The (scale-out) OBS market subsegment, which is part of the file-and-OBS market, is an example of an emerging market. In this IDC MarketScape, IDC attempts to assess the capabilities and strategies of key vendors of OBS solutions." A year ago the 2013 report abstract said: "The (scale-out) OBS market sub-segment, which is part of the file-and-OBS market, is an example of an emerging market. In this IDC MarketScape, IDC attempts to assess the capabilities and strategies of key vendors of OBS solutions." If it arbitrarily changes the basis for a supplier's product inclusion from one report to the next, as it has apparently done with the Marketscape diagram, then comparisons can't be meaningfully made. One reason to have successive reports is to compare the present with the past and see how things are changing. IDC’s tactic here makes that impossible with EMC. We asked IDC what has changed since the 2013 report, apart from ECS being launched, to justify removing Atmos from consideration of EMC's position in 2014. IDC declined to answer, apparently being upset that we ran the story without checking with it first. It feels that, we understand, talking with us after the fact just rewards this behaviour. Boo-hoo.